The Gamer Supreme Liquid Cool Desktop Computer from CyberPowerPC is a ready-to-use gaming system with the performance and aesthetics to match. Specs-wise, it's equipped with a 3.6 GHz Intel Core i9-9900K eight-core processor, 16GB of DDR4 RAM, a 512GB NVMe PCIe SSD paired with a 2TB 7200 rpm HDD, and an NVIDIA GeForce RTX 2080 Ti graphics card. With these combined, this system can quickly boot and load applications as well as play graphically demanding games at high resolution. Other integrated features include 802.11ac Wi-Fi, Gigabit Ethernet, HDMI and DisplayPort outputs, and multiple USB and audio ports. The operating system installed is Windows 10 Home and it comes with a USB keyboard and mouse so you can get started as soon as possible. Based on NVIDIA's Turing architecture, the NVIDIA GeForce RTX 20-series graphics card provides major improvements in performance, memory bandwidth, and power efficiency over its predecessor, the Pascal architecture. Moreover, it features dedicated Ray-Tracing cores for enhanced graphical quality and life-like images. When used with a monitor that has G-SYNC hardware installed, the monitor's refresh rate will sync and lock with the graphics card's output frame rate. Establishing this sync removes tearing and stuttering which can result from conventional fixed screen refresh rates. An additional benefit of G-SYNC is reduced lag so gamers will benefit from the improved command response time as well. This system is built within a CyberPowerPC Eluna 241V mid-tower case and has a 1000-watt power supply. 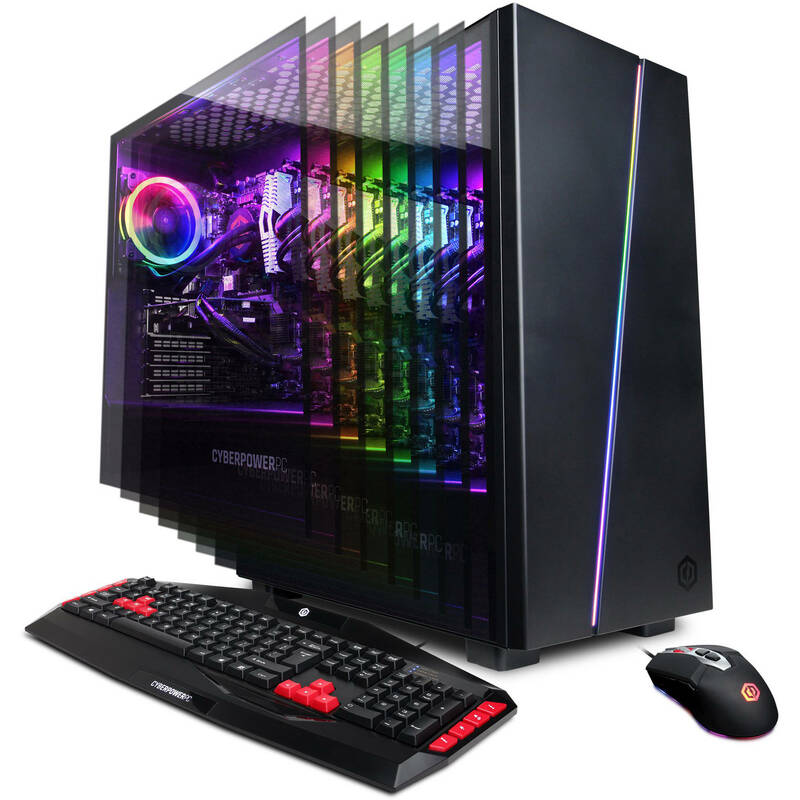 Moreover, it features a tempered-glass side panel, custom RGB lighting, and liquid cooling. If you're going to play online multiplayer games, you'll need a faster internet connection. This CyberPowerPC desktop computer offers 802.11ac Wi-Fi as well as a Gigabit Ethernet RJ-45 LAN jack so you'll be able to have fast wired or wireless internet access. Box Dimensions (LxWxH) 22.75 x 21.75 x 13.0"
What kind of motherboard does it have?